Will it waffle? You bet it will! A little update on a most amusing project I’ve been working on. 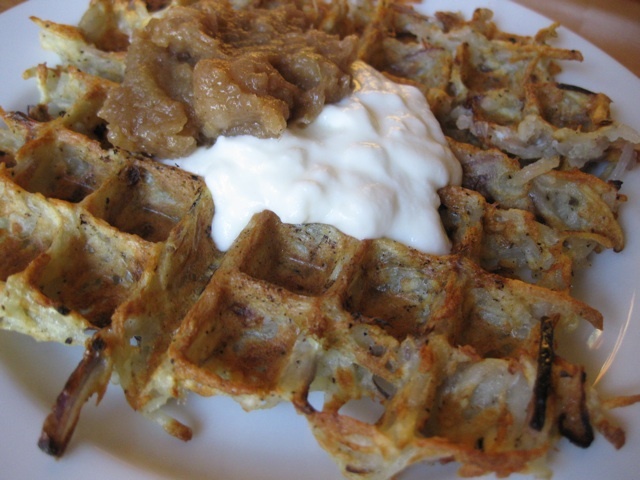 My pal Dan – of the fabulously seasonal Fruitslinger blog – started a new one that answers the age old question – will it waffle? Yep, it’s called Waffleizer. 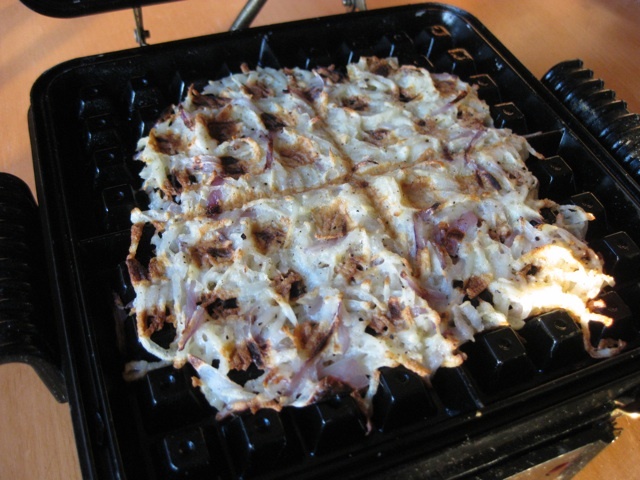 The concept is simple and unique; what can you cook in a waffle iron besides waffles? Turns out, quite a lot. So far he’s waffled burgers, bread pudding, hash browns and s’mores. Though the sub head is “30 answers to the question “will it waffle?””, I bet he comes up with a whole lot more. Dan’s developed some recipes himself and is working with local chefs and food bloggers to come up with more. A few weeks ago, he shot me an email. Would I be interested in contributing a recipe? I was in from the get-go. But what could I waffle? I needed to represent and do it well. It had to be something different and unexpected; it had to look good and taste better. Most importantly, it had to be something someone else hadn’t already laid claim to. And it couldn’t be a waffle, so my beloved bacon waffles were out. Which was a shame. The ideas started flowing and didn’t stop. I thought about griddled or grilled things and immediately, my thoughts turned to a recent trip to India. What about the Indian breads I enjoyed so much? Naan? Parantha? Roti? They’re traditionally cooked on hot griddles or smokin’ hot ovens so this could work. The waffle iron divots would be great for pooling a sauce of some kind. With a giggle and a sense of purpose, I forged ahead. And so the waffled aloo parantha was born. Just writing that makes me throw back my head and laugh. It’s not often that something that makes perfect sense in your head turns out exactly as you expected. But this did and it was fantastic. I served it with a simple dal and a spicy cilantro sauce and it blew our socks off. So then things took a turn toward the crazy. After Dan came over and photographed the process, I couldn’t stop thinking about what will waffle. Since my waffle iron was still out on the table, I decided to put it to use. 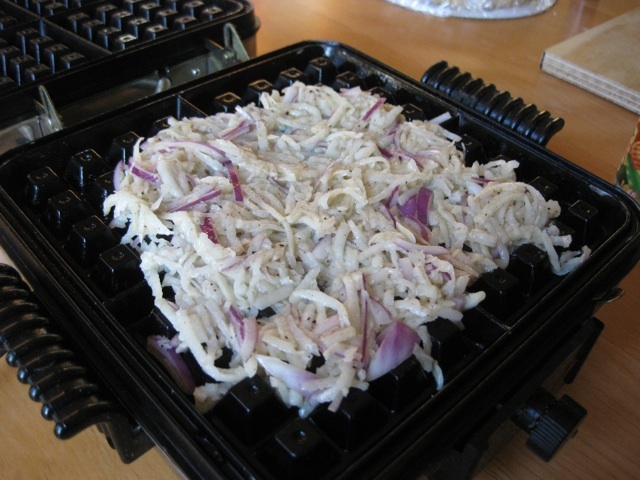 First, intrigued by an earlier post, I waffled hash browns. Several times. Fan-flippin-tastic! Shredded potatoes, onions, salt and pepper plus a little melted butter stirred together and spread out on the iron. Close the lid and 15 minutes later you have one crispy and delicious hash brown. I could not believe how well it worked. Why have I not figured this out before? Then I added an egg to that hash brown mix and turned it into a potato pancake type thing. A little creamier on the inside and topped with apple compote and a little sour cream (or yogurt) it was amazing. I’ve made it twice in the last week. And then, in the spirit of eating only what I had in the house, I decided to use up some bread I had baked earlier in the week and made waffled French toast. 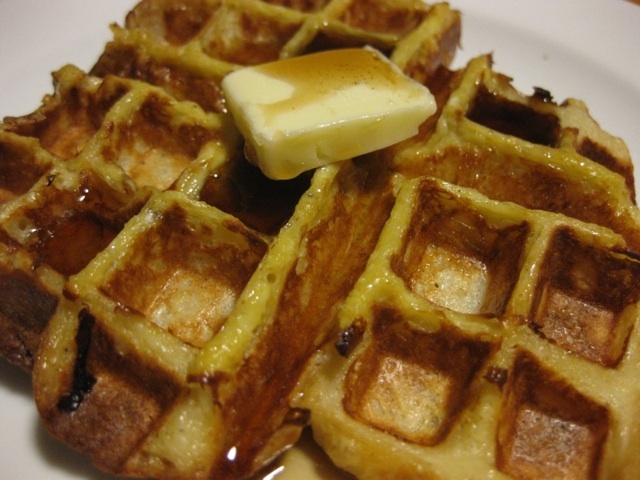 Same deal – soak the bread in a dairy/egg mixture (I used cream, eggs, nutmeg, dark rum) – and pop it in the preheated waffle iron. In 5 minutes, I had creamy, crispy, delicious French toast with none of that turning-in-the-pan and regulating-the-burner-temperature nonsense. I’ve had this waffle iron for easily 10+ years. I hardly use it (though I have been known to lug it to a Wisconsin cabin to make the aforementioned bacon waffles more than once.) Yet, I’ve used it 6 times in the last week. In fact, I made a potato pancake for dinner tonight. Easy, minimal clean up and hands off perfect cooking. You can’t beat it. 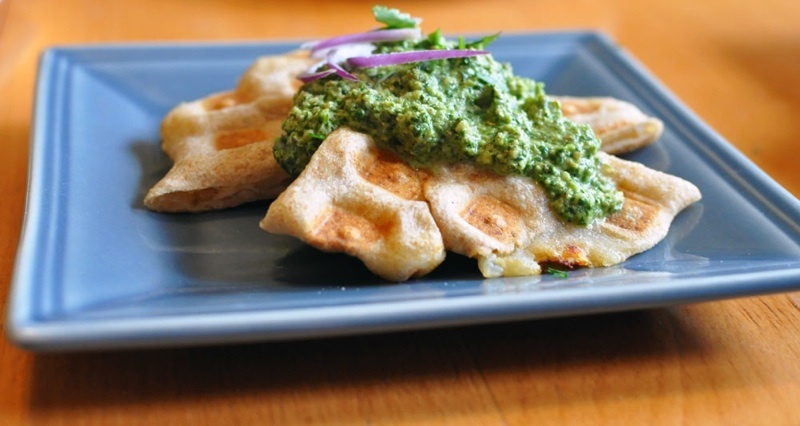 So check out my recipe for waffled aloo parantha over at waffleizer. And give it – or any of the other recipes – a try. It’s pretty funny and I’ll be damned if Dan isn’t onto something. I’m right there with him. STRESS BAKING THERAPY FACTOR: SOLID. First of all, just saying I’m “waffling” something makes me giggle. Then I do, it works perfectly and my first response is utter delight. So yeah, it’s a good one. I’m just waiting for Dan to waffle a falafel because that is too damn funny. Oh, I bet it’s coming. That’s just too good to pass up.